Home » Facebook Ads in Carousel Form! It’s no secret to anyone that works with us that we love, love, love Facebook advertising. The reasons to love it are a long list of positives. Now, there’s even more to love! Facebook has rolled out a new option with Facebook advertising. You may have seen the new format in your newsfeeds. It’s called Carousel ads! Carousel ads can be used in both desktop and mobile formats now. We love this type of advertising for any client that has a product to sell. As you can see from the photo below – a business can increase interest in their product by utilizing more than one photo in each ad. This allows businesses to upload different items that may attract more interest to a potential buyer. Mobile app ads can support up to 5 different images and with that … you of course want to make sure that your images are great quality and appealing! Case in point – FoodPanda utilized this type of ad when they ran a campaign to promote their app. 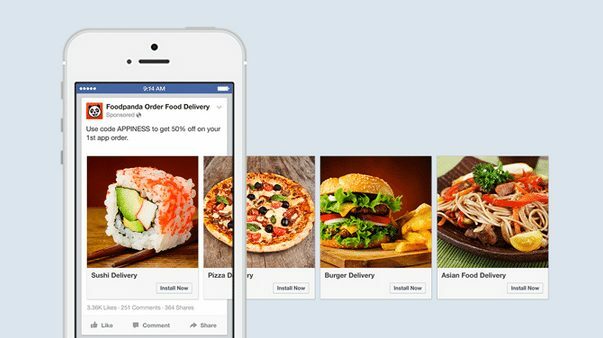 Per Facebook this engagement increased click-through rates by 180% and reduced their cost per install by 39%. … we’re all for anything that reduces costs! Another great idea for this type of advertising is utilizing one product in the ads, but featuring other uses for the end user to experience visually by creating a visual “story”. MINI did a great ad that showcased their car, then featured interior / exterior shots for a more visual experience. This is a great example of a story telling campaign that explains visually, a product. The other great feature of this type of advertising is that you can see which of your photos produces the best results (clicks). With this type of advertising, switching photos and watching consumer insights can create an even better experience for the end user AND reduce your cost of acquisition rates. By watching insights – you can potentially increase your click through rates an additional 12%! 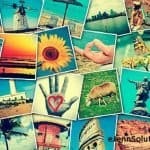 All good things for Facebook advertising and why your business should consider utilizing ads. Most of our clients experience success with their small businesses with a simple $50 – $100 a month ad budget. As with anything, analysis, tracking and watching your insight stats will always give you great information to help you increase conversions and increase how your budget works more for you! You can access the carousel ads feature in power editor, your ads API and the ads create tool on Facebook. Thinking of running ads on your Facebook page? Contact us to learn more – we run small ad spends for free with our current clients! Thank you Jennifer, this was inforative.